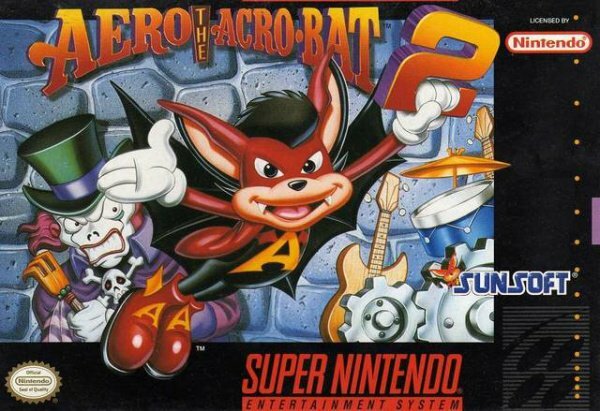 About the time mascot games began exploding on the Super Nintendo console, Sunsoft jumped on the bandwagon with the release of their original platformer Aero the Acrobat. While the game featured many of the classic platforming elements that were showing up in the games of the time period, it was criticized for its bland play control and limited level designs. Sunsoft decided to tweak the formula for their sequel, and this bit of extra attention ultimately made for a much more varied and playable platforming experience the second time around and manages to hang with some of the better Super Nintendo platformers. 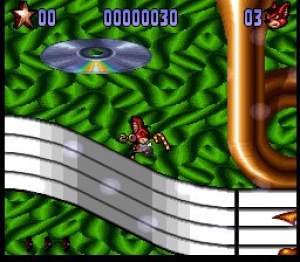 Although there are at least a few new gameplay moves in the game, Aero the Acrobat 2 remains very similar to the first game in both style and playability. 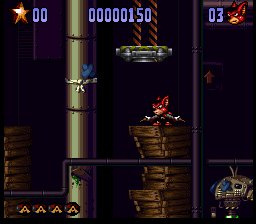 Aero still has his jump and spin moves, both of which allow him to reach platforms of varying heights, as well as dispatch of the game's many enemies. In this sequel, you'll also get to swing from ringing bells, jump on beds and assorted trampolines, and collect all of the circus-style candy and goodies that you did in the first game and with a few new twists tossed in here and there. Also making a return are the cannons from which you can shoot Aero out of in order to reach some of the trickier platforms throughout the various levels. Aero also gets to ride a couple of slick vehicles in this sequel, including a locomotive train and a snowboard. While the train level is more of a standard-type level, the snowboarding levels tend to mimic that of the various vehicle levels that were becoming popular during the 16-bit era. They're not only quite challenging in their design, but these snowboarding levels also offer up a great gameplay diversion from the regular levels in the game. All in all, Aero the Acrobat 2 just feels a lot more playable and responsive this time around and the many new gameplay elements make it a much more well-rounded gaming experience. Graphically Aero the Acrobat 2 is a slick looking game. It features amazing detail in all of the levels and even the multi-layered backdrops offer up some impressive visual eye candy from time to time, especially when you reach the psychedelic motion of the Disco Inferno level. Great use of vibrant colors and a variety of styles in each of the different areas all come together to make Aero 2 even better looking than the first game. You'll see a little bit of everything ranging from icy landscapes to strobing disco levels complete with compact discs and jukeboxes. Aero even manages to look a lot more impressive in his sequel. He was animated well in the first game, but he seems to have a more fluid motion this time around courtesy of a few frames of added animation, not to mention quite a bit more detail in his outfit. It's nice to see that the developers put a bit more time and effort into the visuals for this sequel and it really paid off in finished product. There's no denying that the circus-style musical score of the first game was catchy and certainly a fun experience given the light-hearted theme the game made use of, but it always felt like it needed a bit more variety when it came right down to it. Thankfully, the developers took a bit more time with the soundtrack for this sequel and it really adds a whole new level of polish to the game with so many varied types of musical tracks to enjoy. Each track fits the level perfectly and the tunes are long enough that they don't have to keep repeating over and over again as you play each level. 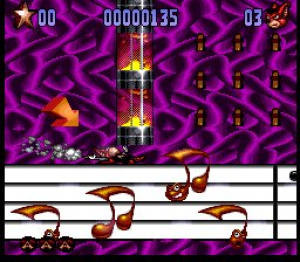 The sound effects remain the same in many places, but the developers did include a few new ones to liven things up a bit. While the soundtrack still isn't on par with later Sunsoft releases like Zero the Kamikaze Squirrel, it's a huge step up from the original Aero the Acrobat score and a great compliment to what is already a very polished title. Aero the Acrobat 2 basically does everything a good sequel should. It takes the best ideas from the first game, fixes many of the flaws, and adds in just enough new material to set it apart from the original game. Better graphics, more variety in the musical score, and a much better gameplay system turn what was originally a fairly bland platformer into a unique and challenging platforming experience that should thoroughly satisfy any fans of the genre with room to spare. If you can appreciate a game that's just downright fun, you should definitely check out Aero the Acrobat 2. It's still one of the better platformers to come out of the 16-bit era and a game that's every bit as much fun to play now on the Virtual Console service as it was fifteen years ago on the Super Nintendo console. wow. a lot higher than i expected after the first game. usually sub-par mascot games tend to have sequels of similar quality. glad to see this one's different. if i didn't have so many others to grab, i might download this one at some point. Worst Mascot Character design everrr....On second thought, Bubsy takes the cake! @ bro2dragons: How is the prequel "sub-par" when it has a reviews score of 6/10? And how come you're surprised? They already reviewed Aero 2 a few weeks back and gave it an 8/10. I guess Aero isn't so bad, well Aero 2, at least. I'm still probably not going to get it, but it does sound like fun. @Keeper: i guess i missed the earlier review, then. and yeah, technically a 6/10 is above average, but my impression from the review itself left the game sounding slightly more "bleh" than "meh." @Keeper - actually, it was reviewed back in late 2009, only for the Retro section. I hate this game. But great review, Corbie. Never played this one. Sounds more interesting than the first, but I'll save my points for now. I'm still not buying this, not a big fan of the series. So, does this mean we'll get Zero the Kamikaze Squirrel sometime? It just slays me how so many people get on here and post comments on a game they have no interest in. Why even visit this page? Anyhoo I'll be getting Aero 2. The first one was decent and I'll never turn down a good platformer. Especially since I never got the chance to try this one before. I don't like the game. But read Corbie, yes. It should release over here before August is over. Skipped the 1st one waiting for this. Because maybe the review will change their mind? Why the hell does anybody visit a review page? Probably to read the review. Why do they comment? To give their reaction. It's as simple as that. I just noticed Corbie's new avatar, and it is awesome. Good job, Iguana. This is what a sequel should be like, as the description said. This is the one I'm saving those points for after skipping the first. Hopefully they bring out Zero The Kamikaze Squirrel sooner or later. I absolutely hated Zero The Kamikaze Squirrel. Does this game feel similair? Can't wait for this. Ever since sunsoft announced that both Aeros and Ufouria were on the way, I have been pumped to replay this 16 bit gem. Even though, in a lot of ways, its more generic than the first title. For example, giving him a snowboarding level? That's so much more derivative than the first game's roller coaster section. I might give this a shot, but I have other games higher on my list.